This article and presentation was produced by Kevin Martelli. The following presentation “A Perspective on Value Investing” starts with a brief introduction on value investing based on my professional journey and includes an “Analysis of Multibagger Stocks,” a historical study of stocks around the world that achieved more than 10x return in the 15 years period between 2000 and 2014. This analysis was inspired by Thomas Phelps book “100 to 1 in the Stock Market,” published in 1972. Today, just like in 1972, there are many lessons to be learned by observing the exceptional long-term performance of a few selected stocks. In particular, studying historical case studies helps in getting better at: (i) assessing the key drivers of long term value creation; and (ii) identifying how there can be a significant discrepancy between short term market perception of risk vs. long term real risks. Furthermore, observing how most market participants missed great investment opportunities teaches something about the importance of being humble about your own assumptions and opinions and the many challenges we face as long-term oriented investors in making even rough predictions about the future. Performing this research has also been useful in better understanding that there are many patterns that can lead a particular investment to achieve superior shareholder returns (the 3 case studies in the presentation are in fact very different from one another). Although “the rear-view mirror is always clearer than the windshield,” it is very helpful to increase one’s database of investments that worked in the past in order to be open-minded and better prepared in the search for new investment ideas. Additionally, one should also keep in mind that studying historical multi-bagger stocks is also a good way to reduce one’s investment mistakes. In fact, for every multi-bagger stock that manages to grow revenues at 20-30% per year there is likely to be at least one traditional company that is probably being disrupted and is likely to disappoint its shareholders in the future (see the case study in the appendix). Avoiding these companies can be as valuable as identifying good investment ideas. Turning towards the search for multi-bagger stocks over the next 5-10 years, I think it will become increasingly important to be able to identify business leaders and company cultures that are customer-centric and able to be continuously innovative, while avoiding the pitfalls of corporate bureaucracy and hierarchy. Although most firms would argue they are already pursuing these sound business principles, very few are able to execute on them. Thus, in the next few years as the pace of technological disruption accelerates and traditional barriers to entry (such as high distribution costs) continue to diminish, the share of companies that can create value for shareholders regardless of the quality of their leadership team is likely to decline is well. The challenge for investors is being able to identify “intelligent fanatics” CEOs and great company cultures early on and have the conviction to invest in them for the long term. On this topic, I think public equity investors can learn a great deal from Silicon Valley’s leading venture capitalists. As a final point, it is interesting to note that Thomas Phelps’ book was published at the beginning of 1972, before the 1973-74 bear market, which offered exceptional investment opportunities to rational investors who had cash to deploy. Currently, based on most metrics, asset prices are generally quite expensive, sustained by a combination of unprecedented interventions by monetary authorities and widespread optimism in financial markets. Both interest rates and price volatility around the world are at a historic low. I have no idea what the exact trigger and timing of the next bear market will be, but hopefully this historical analysis will help investors maintain a rational long-term perspective when a more risk-adverse market sentiment eventually returns. 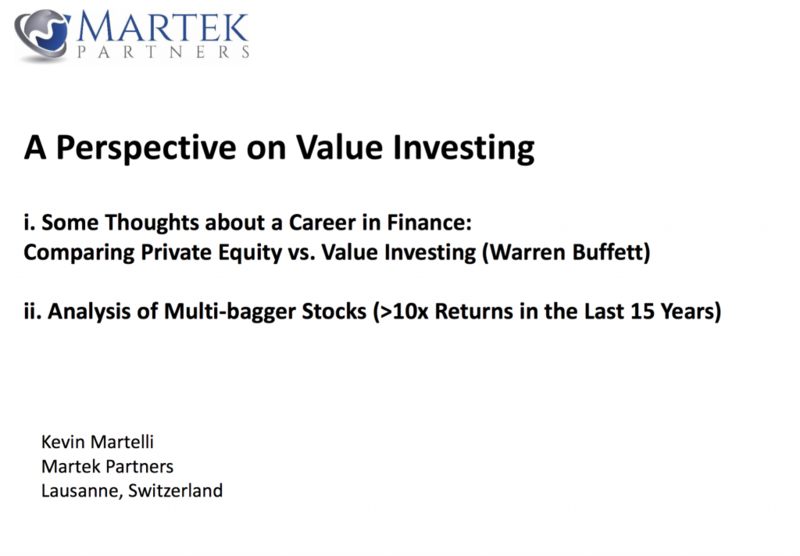 If you enjoyed this presentation, you may also like the following article by Kevin Martelli: Would a 30 Year Old Warren Buffett be Studying Silicon Valley Tech Companies? Middleby Corp. appears not to be on the list of 100 baggers in the “100-Baggers” book. 350-bagger. A broker I worked with at that time recommended it to his clients.